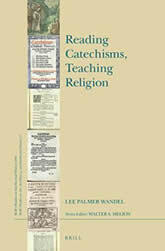 Reading Catechisms, Teaching Religion makes two broad arguments. First, the sixteenth century witnessed a fundamental transformation in Christians’, Catholic and Evangelical, conceptualization of the nature of knowledge of Christianity and the media through which that knowledge was articulated and communicated. Christians had shared a sense that knowledge might come through visions, images, liturgy; catechisms taught that knowledge of ‘Christianity’ began with texts printed on a page. Second, codicil catechisms sought not simply to dissolve the material distinction between codex and person, but to teach catechumens to see specific words together as texts. The pages of catechisms were visual—they confound precisely that constructed modern bipolarity, word/image, or, conversely, that modern bipolarity obscures what sixteenth-century catechisms sought to do.